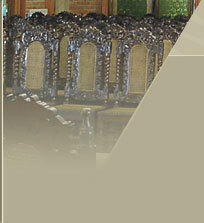 he Ostoya Manor can organize conferences, meetings and symposiums for firms and concerns. urthermore these conference - rooms can be used as an ideal place of banquets and your words, said in such refined interiors will acquire special importance and sink into listeners' mind. e did our best, Dear Guest, to make your conferences as unique as possibly. o gain such effect we have combined modern multi - medial techniques - striking methods of visual contents' presentation. sage of projector showing data directly from computer, makes the presentation more effective and interesting. ou have, Dear Guest, at your disposal four conference - rooms with different number of seats. uch differentiation permits us to come up better to your expectations. lease make a reservation with seven - days outstrip.